Which states share Gulf waters? Which other countries share the Gulf? What are some of the industries in the Gulf? How can people in these industries help keep Gulf waters healthy for aquatic life? 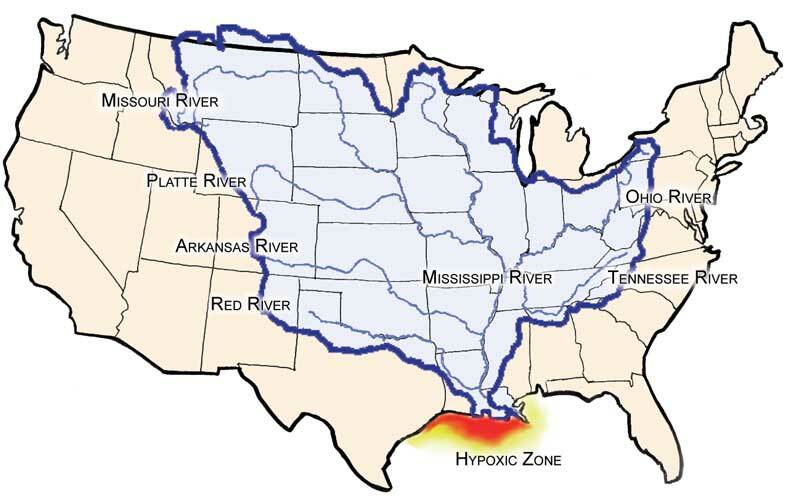 What influence does the Mississippi River have on the Gulf? What is a hypoxic zone and its impacts? How are hypoxic zones formed? How can they be prevented? What are some of the ecosystems in the Gulf and what kind of organisms would you find in them? How are oil and gas platforms similar to coral reefs? What might you see on a Texas beach? What are currents? What do they do in the Gulf? How can you help marine mammals or sea turtles? What do you think scientist Sylvia Earle meant when she referred to the Gulf of Mexico as America’s Sea? What does it mean to you? The Gulf of Mexico is the ninth largest ocean basin in the world, covering almost 600,000 square miles. This is twice the size of Texas. At its deepest point the bottom is 2.7 miles underwater, but most of the Gulf is much shallower. About 60% of the Gulf is less than 700 feet deep. Rivers carry the runoff and other waters from Texas’ watersheds to our estuaries. Because of this estuaries tell us a lot about how well we are protecting our water resources. 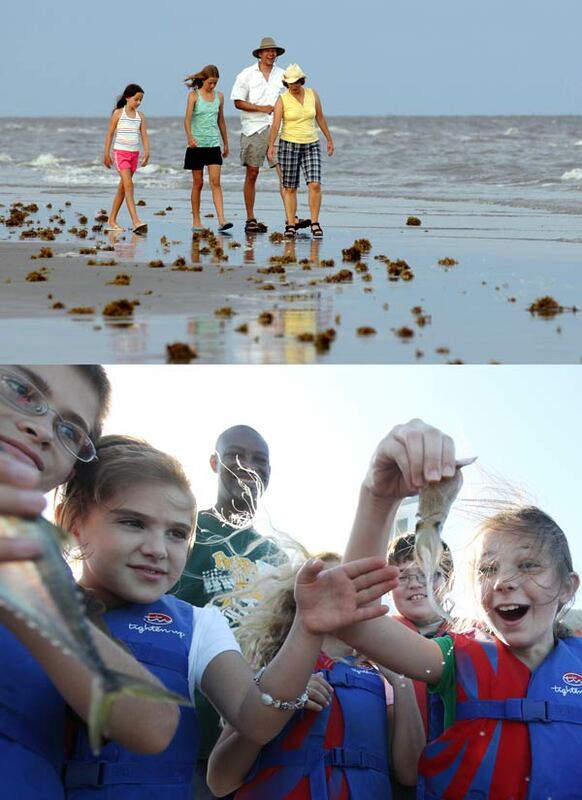 Every day, you and I affect the health of the Gulf ecosystem. Cooking, cleaning, watering the lawn, flushing, and even driving the car can cause water pollution if done without regard to the impact on the environment. When multiplied by what the millions of us do who live in the river basins that empty into the Gulf, it is easy to understand that how we treat our watersheds affects the health of Gulf ecosystems. 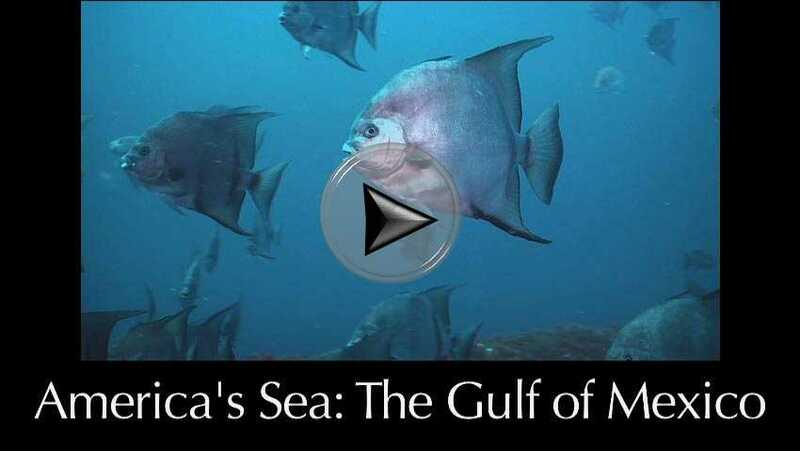 The Gulf is one of the most productive waters in the world for aquatic organisms. It provides habitat for many of our most important seafoods. The Gulf is productive in other ways, too. The Gulf holds one of the world’s largest reserves of oil and gas, leading to an extensive petroleum industry. The Gulf’s combination of ecosystem productivity, industrial importance, and accessibility has made it one of the most important waters to people on Earth as well as one of the most threatened by human actions and neglect. Starting from the coastline and moving out into the Gulf, the edge is full of wetlands, estuaries, and bays, opening out to wide and shallow shelves that gradually slope into deep waters. The floor of the Gulf is mostly a vast expanse of soft mud. The freshwaters that flow into the Gulf greatly affect the health and productivity of the aquatic life there. One of the most important influences on aquatic ecosystems is the Mississippi River, which accounts for nearly 90% of all freshwater inflow to the Gulf. The watershed for the Mississippi River is over six times larger than Texas. It includes 31 states and two Canadian provinces. (Fig. 12.1) Like an enormous water hose, the Mississippi River pours freshwater into the Gulf. The natural flow from the Mississippi River has always influenced productivity in the Gulf. Freshwater inflow provides nutrients that are carried by currents throughout the Gulf. The nutrients promote growth of phytoplankton. These are primary producers that form the base of an extensive food chain including zooplankton, macroinvertebrates, fish, whales, sea turtles, sea birds, and many other forms of marine life. Human activities have added wastes, pollutants, fertilizers, and extra sediments to the flow of the Mississippi River. As long as the Gulf remains healthy it can absorb the impact of some level of nutrients and pollution. Today, as much as 159 million tons of sediment may flow into the Gulf each year. Increased amounts of nitrogen and phosphorous fertilizers from agriculture in the Mississippi River’s watershed have caused over-enrichment and direct pollution of Gulf waters. Extra nutrients have upset the natural balance of aquatic production in Gulf waters adjacent to Louisiana and Texas. The nutrients create a rapid, massive growth of phytoplankton at the water’s surface in the summer. This results in a biomass of primary producers far beyond what would occur naturally, often called an algae bloom. The increase in phytoplankton then affects the Gulf food chain, increasing food for zooplankton and other aquatic life. But the amount of phytoplankton produced in such a short time is well beyond the capacity of primary consumers to graze it down to a balanced level. Phytoplankton have a relatively short life span, so much of the phytoplankton dies before it can be consumed. When the phytoplankton organisms die, they sink down to the ocean floor where decomposers, such as bacteria, break them down. At the time of year this usually happens, the water column is stratified, meaning that temperature and salinity differences between surface and bottom water layers prevent the layers from mixing. This isolates bottom waters from being resupplied with oxygen from the surface. The plankton that has sunk to the bottom is decomposed by bacteria, but large amounts of dissolved oxygen are consumed by the bacteria and the dissolved oxygen is quickly depleted. The result is creation of a hypoxic zone, often called the “dead zone.” This is an area of very low to no dissolved oxygen. Organisms capable of swimming away such as fish and shrimp may leave the area, but life that lives in or on the bottom has nowhere else to go. Many species can experience stress or die as a result of this low dissolved oxygen. Hypoxia adversely affects production of seafood and other aquatic life as food webs are disrupted and organisms at all trophic levels are harmed. Hypoxia can last for several months until the water layers mix, which can happen due to storms or when the surface water cools in fall and winter. Sandy beaches make up over 98% of the Texas shoreline. Texas’ beaches vary from being part of the mainland, to creating peninsulas, to forming our barrier islands. Texas has the most extensive barrier islands in the Gulf, including Padre Island which is the longest barrier island in the world. It is 130 miles long and protects nearly a third of the Texas coast. Beaches in the western Gulf of Mexico, which is where Texas is located, are considered to be moderate to high energy beaches where there are large waves most of the year. The eastern Gulf is a low energy area, which has smaller waves, on average. This is why the Gulf coast of Texas is a better place for surfing and wind sports, such as windsurfing and kiteboarding, than the Gulf coast of Florida. Just off the beach, especially in the moderate to high wave energy areas, there are one or more sand bars and troughs getting progressively deeper as you go offshore. That’s why as you wade into the Gulf from a Texas beach it quickly gets a little deep, but if you keep going it gets shallow again, and then it gets deep again as you wade out farther. Aquatic life is generally abundant where the waves crash into the shore, but it’s not easily seen. Most species here live by burrowing in the shifting sands of the bottom. Beach clams, marine worms, and sand dollars are common in the surf zone. This is where the waves wash back and forth along the beach, also called the swash zone. The beach slopes steeply up to a flat area that generally stays dry. This is called the backshore, and is where people usually walk and lay on beach towels. This is also the part of the beach where you can find sand crabs and occasionally nesting sea turtles. Sand dunes make up the zone behind the backshore. They vary in height from only a few feet up to the largest in the Gulf at 30 feet on Padre Island. They are usually covered with grasses that help hold the sand in place. The dunes help protect areas behind the beach from wind and storms. Sandy beaches are important to Texas’ economy because many people enjoy going to the beach. There are many beach parks along the Texas coast. All of these are great places to visit, go fishing, or go surfing. In addition these parks help protect wildlife and aquatic life. Life in the Gulf is diverse because there are many different ecosystems and habitats that support many kinds of organisms and species. Even in the deepest and darkest reaches of the Gulf there is life. Chemosynthetic communities are found deep in the Gulf. These form near cold seeps where hydrogen sulfide, methane, and other hydrocarbon-rich fluids seep from the Gulf’s floor enabling organisms there to use these resources in chemical reactions that produce energy. There are other communities deep in the Gulf waters consisting mostly of bacteria and tiny benthic organisms. Macroinvertebrates abound, such as crabs, mollusks, shrimp, and jellyfish. Currents move throughout the Gulf forming big loops (see sidebar). These currents help create areas where water from the bottom rises to the surface. When water rises this way it is called upwelling and mixes nutrients in the water. The increase in nutrients in surface waters enables primary producers, such as phytoplankton to grow and become food for zooplankton and filter feeders, such as the giant whale shark or Bryde’s whale. The plankton allows for growth of smaller filter feeders as well, such as menhaden which travel the Gulf in large schools. These become prey for large pelagic fish, such as tuna and mackerel. There are also frequent rapid increases in phytoplankton called algae blooms. Sometimes the species of plankton involved have toxic characteristics, which are then called toxic algae blooms, or harmful algal blooms. These are sometimes also called “red tides” because of a red or reddish brown color caused by some phytoplankton species. The blooms can kill fish and marine mammals, and cause health problems for people exposed to the water or when the blooms reach close to shore. On the coral reefs there is an abundance of invertebrate species that use the hard surface as a place of attachment. This life attracts small fish, which attract larger predators, such as groupers, amberjack, and snappers. The beach zone, oil and gas platforms, deep canyons, and more all add to the diversity of habitats for Gulf life. Species normally associated with land are also found here. There are turtles and birds using special adaptations for a life at sea, such as the sea turtles’ flippers and the sea birds’ “tear” glands that allow them to secrete excess salts. Coral Reefs — Of the Gulf’s many ecosystems, coral reefs stand out as the most biologically diverse, productive, and complex of all. They are economically important as sources of food and medicinal products, and they provide shoreline protection in some places. They also are a source of great natural beauty and provide significant tourism opportunity. However, degradation and loss of this ecologically and economically valuable habitat is a worldwide concern. Coral reefs are among the most endangered marine ecosystems on Earth. Coral reefs are tropical, shallow-water ecosystems. There are only two true coral reefs in the northern Gulf of Mexico. These lie about 100 miles off Texas within Flower Garden Banks National Marine Sanctuary. Texas’ coral reefs are the northernmost coral reefs in the Gulf of Mexico. Fortunately, they are some of the healthiest coral reefs in the Western Hemisphere. Flower Garden Banks sanctuary received its name from the colorful collection of reefs that resemble a flower garden when viewed from the surface. They sit atop salt domes, which rise up from the sea floor. The reefs are about 60 to 400 feet below the surface. The sanctuary is visited by a wide array of aquatic life, including numerous species of rays and sharks, sea turtles and marine mammals. Over 23 kinds of coral and approximately 400 species of reef invertebrates inhabit the banks. This includes at least 27 species of sponges, 20 species of polychaetes, 162 species of mollusks and 36 species of echinoderms. Over 280 fish species thrive in the reefs, including snapper, hogfish, groupers, puffers, and angelfish. Whale sharks visit in the summer and in winter you can see schools of large hammerhead sharks and rays. There is even a resident population of over 70 manta rays at the sanctuary that are regularly seen by visitors. The Gulf of Mexico contains thousands of species of animals, algae, and other life that need hard surfaces to cling to in order to complete their life cycles. 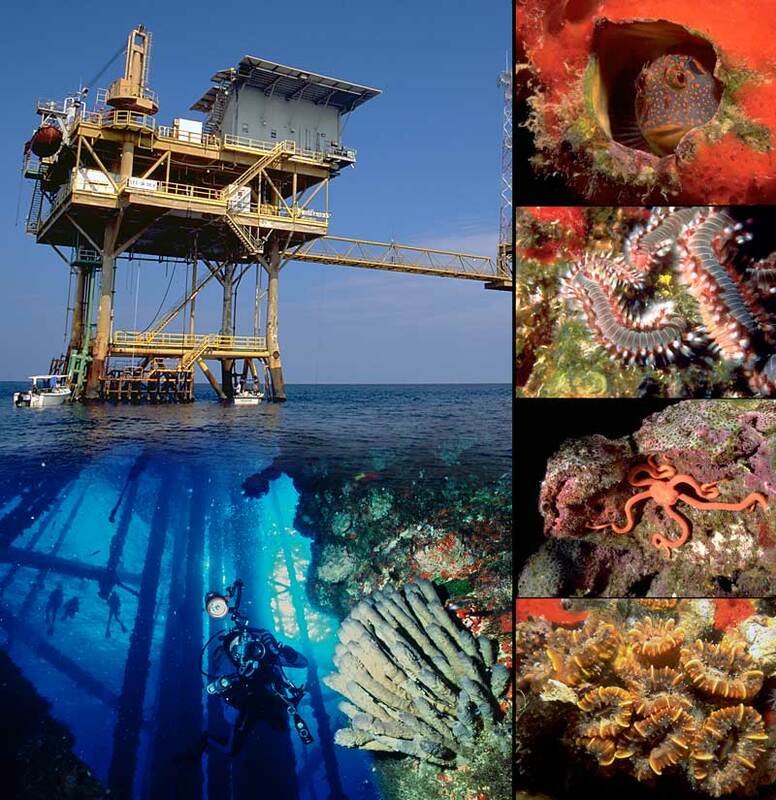 Since the Gulf has very little naturally occurring reef or hard structure habitat, man-made structures such as oil and gas platforms give invertebrates such as corals, sponges, polychaetes, mollusks, echinoderms, and other animals the hard surface they need to grow and thrive. Energy from the organisms that accumulate over time then flows up the food chain, as primary producers feed consumers, and predators feed on prey. New habitat is then created for larger predator species, such as snapper, grouper, mackerel, shark, and other fish. Even sea turtles benefit from the new feeding opportunities. This habitat, in turn, provides fishing and diving opportunities for people. You may wonder what happens to these platforms when they get old. Many continue to enhance the Gulf’s productivity. At the end of a platform’s functional life some are cleaned and toppled into the water in place. Others may be cut into large pieces and transported to another spot in the Gulf where they are sunk to the bottom, usually along with other old platforms. This is how an underwater artificial reef is built. There are now over 150 production platforms making up these reefs. While the presence of these new reefs provides habitat to many native species, the reefs also provide a home for invasive species. Lionfish and orange cup coral which are invasive species have moved into new areas in the Gulf because of the new habitats formed by the artificial reefs. The orange cup coral is now the most commonly found coral species on many of the platforms. Marine mammals — The Gulf of Mexico is home to 28 species of marine mammals. One is even an herbivore that inhabits coastal rivers, estuaries, bays, and nearshore coastal waters. This is the West Indian manatee, or sea cow. This species is rarely seen in Texas, but does frequent all of the other Gulf states. All other marine mammals in the Gulf are cetaceans, or whales and dolphins. The most common is the Atlantic bottlenose dolphin. They are often seen in Texas’ bays and estuaries. Other species include the Atlantic spotted dolphin, beaked whales, spinner dolphins, and even killer whales. The biggest marine mammal in the Gulf is the sperm whale. It occurs primarily in mid-depth waters off Louisiana and Texas. For reasons not well-understood, whales and dolphins occasionally get stranded on land. While stranded animals sometimes are found to be ill or injured, many times the animals appear perfectly healthy. Volunteers often try to help rescue stranded marine mammals. Increased education of the public, active management, and conservation efforts have helped ensure healthy populations of these species in the Gulf. Sea Turtles — There are seven species of sea turtle in the world, five of which live in the Gulf. All have nested on Texas’ beaches, some perhaps in large numbers historically, and all are now listed as threatened or endangered. Harvesting of the eggs for use by people, killing adult turtles for meat and household products, and incidental capture in shrimp trawl nets are the biggest reasons sea turtle populations dropped so low. Today, no harvest of eggs or adult turtles is allowed, and special devices, called turtle excluder devices, are required on commercial fishing nets to help prevent harm to turtles. Recovery of sea turtles will take many years. Efforts to protect nesting sea turtles on Texas’ sandy beaches help make sure turtles are successful in laying eggs and hatching baby turtles. Texas’ inshore and nearshore Gulf of Mexico waters now provide important habitat for three sea turtles: Kemp’s ridley, green, and loggerhead. Special help is going to the Kemp’s ridley which is the most endangered of all sea turtles. This is the smallest sea turtle in the world, weighing about 100 pounds when fully grown. It tends to stay in shallow water less than 165 feet deep and prefer to eat crabs, but they will also eat shrimp, clams, jellyfish, and tunicates. As with all other sea turtles, the male Kemp’s ridley spends its entire life after hatching in the water, while the female only comes ashore to nest. For the Kemp’s ridley, this takes place between April and mid-July. The female nests by crawling up the sandy beach to a point beyond the reach of the waves, where it digs a large hole in the sand with her back flippers. There she lays about 100 eggs, covers the eggs with sand and immediately returns to the water and swims away. The whole process takes about 45 minutes. The eggs hatch about 45 to 60 days later. The young crawl out of the sand and quickly move down the beach to escape predators. (Fig. 12.4). Once they reach the water they swim through the surf zone and into the Gulf where they are largely carried away by the currents. It takes about 10 to 20 years to reach maturity and most breeding females nest at the same beach where they hatched. Once they start nesting, most return to the exact same beach each time they are ready to lay their eggs. Because of this instinct to return to the same beach, nesting areas are well known and are now protected. The primary nesting ground for the remaining population of Kemp’s ridley sea turtles is a 16-mile stretch of beach in Tamaulipas, Mexico. Biologists at Padre Island National Seashore in Texas are now re-establishing and protecting a nesting beach on Padre Island. To do this, nests are located and eggs are placed in an incubation facility or a special beach enclosure to protect them from natural or human-cause threats. The eggs are then hatched and when the young are ready to leave the nest they are released on Padre Island and guarded from predators as they enter the surf zone. Fish and fisheries — The Gulf is a place of incredible biodiversity with over 1,500 species of fish calling it home. But it is the seafood that comes from the Gulf that many people know best. Commercial fisheries annually catch over 1.5 billion pounds of seafood. 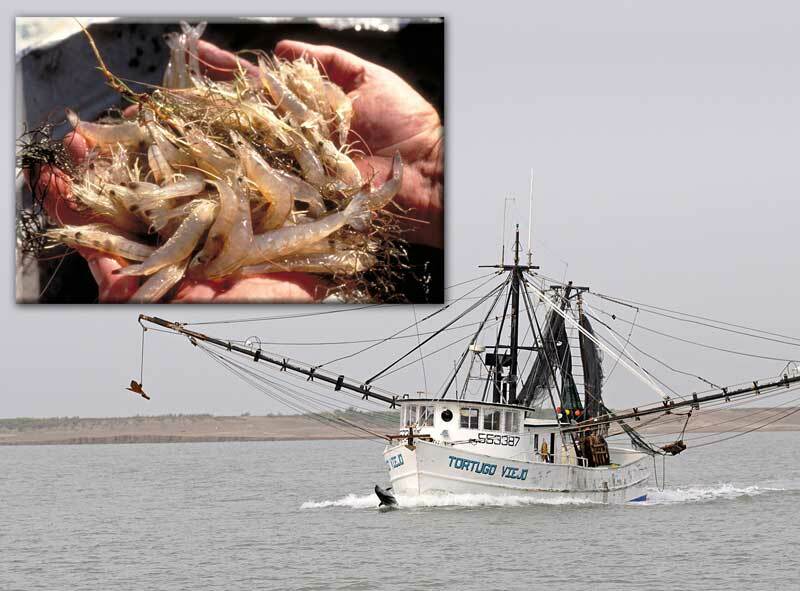 Shrimp and oysters are the predominant shellfish harvested in Texas. (Fig. 12.5) Catches in the Gulf account for 70% of all the shrimp and oysters that go into our grocery stores and restaurants across the U.S. Recreational fishing is also important, including catches of flounder, snapper, drum, seatrout, mackerel, shark, and tarpon. Forty-five percent of all the people who go fishing in saltwater in the U.S. fish in the Gulf of Mexico. The Gulf is one of the most productive, yet ecologically threatened bodies of water in the world. It is an area of intensive oil and gas development, some of the world’s largest commercial and recreational fisheries, and contains many of the U.S.’s largest ports and most active shipping lanes. The employment provided in these industries and economic value to Texas and the country is enormous. Yet, over 50% of our coastal wetlands are gone, up to 60% of the seagrass beds have been lost, and over 50% of our oyster reefs have disappeared. In Texas, reduced freshwater flow into estuaries and bays reduces the amount of certain kinds of habitat needed by many of the Gulf’s most important species. The Mississippi River, which provides the greatest amount of freshwater inflow in the Gulf now carries such high loads of nutrient contaminants that large hypoxic areas develop in nearshore waters off the Louisiana and Texas coast each year stressing, or even killing aquatic life. Yet the Gulf is amazingly resilient. Sea turtles that just a few years ago were on the brink of extinction are coming back, thanks to protective efforts in the US and Mexico. Fishing regulations, like banning use of certain types of fishing gear, have allowed several species of fish to increase in number and size. With about 1,000 natural seeps of oil into the Gulf totaling almost 50 million gallons of seepage per year (the size of a super oil tanker), the Gulf is naturally filled with bacteria that can feed on and break down spilled (or seeped) oil. This natural resilience has allowed the Gulf to bounce back sooner than probably any other body of water in the world from the damaging effects of accidental spills. Scientists will continue to study the Gulf for long term or cumulative impacts. Increasing knowledge about how the Gulf works is leading to better conservation decisions on land and in the Gulf. We now know that we can have a healthy economy and a healthy environment in the Gulf if we work together for that goal. 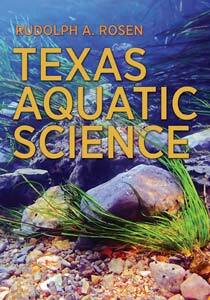 Texas Aquatic Science Gulf of Mexico was written and edited by author Rudolph Rosen. Project support came from the Ewing Halsell Foundation and the Sport Fish Restoration Program. Fig. 12.3 — Marine life on coral and artificial reefs in the Gulf is diverse and beautiful. Anglers enjoy fishing on the artificial reefs and underwater divers visit Texas coral reefs at Flower Garden Banks National Marine Sanctuary. Recreational fishing and diving charters are available to visit these areas.